What woman doesn't love a GNO (girls night out) or GDO (girls day out...I just made that one up). Boy oh boy do I have the perfect event for you and your best girlfriends. The Outlets at Traverse Mountain is having their 1st Annual Shopping Extravaganza! The event will take place on Saturday, September 14 from 10AM-4PM. So what is the Shopping Extravaganza? Well other than the obvious of shopping, the day will be filled with entertainment, lunch, dessert, special discounts, and thousands of dollars in prize giveaways! Oh yeah, and you'll no doubt have a ton of fun! Tickets are $15 each and you can purchase them here or at the Customer Service desk at the Outlets. A $15 ticket includes lunch, baggage check, live entertainment, dessert bar, and a free photo booth. Each ticket holder will also receive 5 free prize tickets. 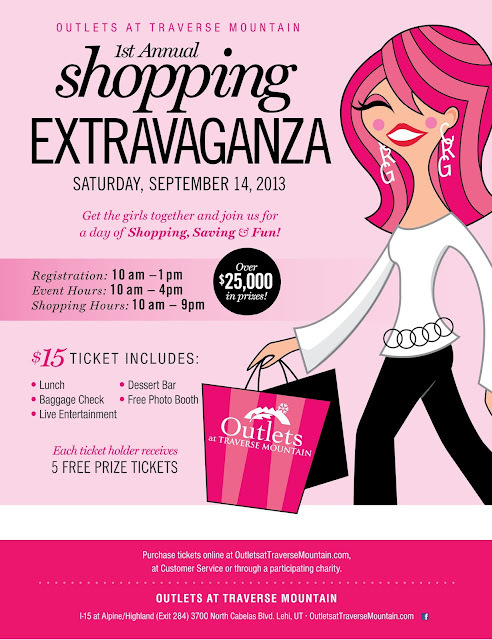 A day full of amazing discounts, prizes, food, and a day with my girlfriends...you bet I'll be there! Will you?